Open (or wait a bit) 1.07 (or older) and press "Yes" when asked about the update to open the update page with all updating information. Added "Donate" option in "About" menu. Updating to new version is exactly the same as in all previous versions. Just copy paste "user" folder (more information in update page if doing this the first time). License keys don't change and are the same. There is literally nothing new in updating process. From new version pricing changes. 5$ per month (or 50$ per year) if you use two programs (for example themaRegister, themaPoster). 7$ per month (or 70$ per year) if you use three or more programs (for example themaRegister, themaPoster, themaManager, themaLeecher). In case of multiple programs 7$ is to extend license keys for all programs (not just one). The price for new license stays the same 30$ which will get you a new license key and expiration date will be set for one year in the future (one year of free usage). You can extend for as many months as you want at once. For now you can continue to use old version if you wish without new monthly pricing, but you won't get any fixes, improvements, new features and support (since all fixes will be made in new versions). 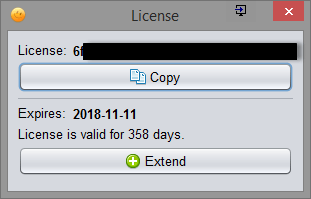 If you bought the program in 2017 the expiration date for the license key is set to "date bought" + 1 year. For example bought on 2017-06-21, the expiration date is now 2018-06-21. If you have more than one license of the same program (themaPoster for example) it's 3$ (or 5/7$ if you have sets of programs) per key. The expiration date for all other license keys is set to 2018-01-10 (only affects new version). If you have ever donated email me to themaRegister@freddy.lt mentioning transaction details (email, transaction id, or purse number), your license keys with program names and I will extend your expiration date rounding in your favor. There is new menu under "Help" -> "License" where you can see the license information and copy the license key fast when needed. At the bottom there is new number (which means days the license is valid for) and two buttons: first one just opens the same "Help"->"License" window. Second - opens page in browser with extending information. The number at the bottom becomes yellow when less than 10 days left until expiration date and red when less than 5 days left. When less than 3 days you will see a small information message with reminder to extend. The pricing needed to be done in order to maintain the project. It was suggested by a lot of users. I just can't work for free already since I need to make a living out of something. The funds will also be used to maintain servers, buy new internal updates, hiring new people. I will have more motivation, will try to work more, make the fixes, improvements and new features faster. Websites with upgraded SSL will only work from new version. Some already doesn't work old version and there will be more in the future probably. There are a lot of new features and improvements (more will come in future updates as well). There are also a lot of other important bug fixes which are mentioned in the change log. New ReCaptcha (where you need to press to make a tick) will only work from new version with auto-captcha services. I had the chance to test more DeathByCaptcha service and I can recommend them as well now (along with Anti-Captcha) since it seems they work quite good. Since I always try to listen even to minority. 3$ per month (or 30$ per year). Extended for all thema programs which you use (themaPoster, themaManager, themaLeecher, themaRegister). That's how it will be. If I receive enough support with users updating to new version I will continue to work on the project. P.S. To admins: is it possible to get the right to edit my own old posts in this topic? I seem to able to that in my other topics, but not in this one. Improved when copying license key to include short program name "TR" at the start (just easier and people won't forget that). New look with two themes: Light and Dark. Dark theme is only available for larger than 1400x800 resolutions because of larger sizing. You can still choose "Old Look" in settings for now just in case. Added new auto-captcha service "CheapCaptcha". Improved (increase) file dialogs default size a bit to make more practical. Improved to remember if main window was maximized or not before closing.